The bicycle is the ideal transportation method to move around central Tokyo, do sightseeing at your own pace, and stroll around the city without worrying about train times, traffic jams, and all the fuss about driving etc. The riding pace of the bicycle will let you discover details of Tokyo scenery, experience many things and meet people that you would not if you were moving around on train or by car. You'll get to stop by interesting shops, traditional confectionaries, and many points of interest at your own leisure, instead of passing by on a sightseeing bus or the train. You can even spend a few hours just lying on the grass in one of the many beautiful parks. All that can be done riding the bike around Tokyo! The large super-city of Tokyo suddenly becomes fairly small, once you get on your bicycle, and you'll immediately recognize how easy and fun it is to pedal around. Go and find out for yourself! 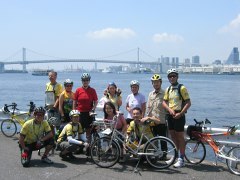 This site is intended to assist overseas visitors to Tokyo, especially those interested in cycling around Tokyo. This site (and our support) will not only provide tips on cycling around the Tokyo, but introduce you with a list of various half to one day rides, to assist you in making your cycling in Tokyo an enjoyable and worthwhile one. 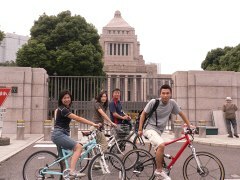 The site will also be useful to local cyclists that reside in Tokyo. Lastly, it is our hope that we, the staff, can establish a good relationship with cyclists around the world though this activity. Welcome to Tokyo, and have a good time cycling here! TokyoTopia is a very organized website for getting information about Tokyo and Tokyo life. Run by a UK Tokyoite who's lived in Tokyo since 2001, it has useful and everyday information to navigate the city and make your stay/life in Tokyo interesting and trouble free. Contents include traffic and geographical information, facts about Tokyo and Tokyo culture, shopping and eating, and everyday life. The are very comprehensive and give you a clear understanding about life and culture, and how things "go" in Tokyo. As the logo of TokyoTopia says, this website is your search for information on Tokyo Made Simple. This page contains an archive of all entries posted to Cycle Tokyo ! Weblog in the Site Information category. They are listed from oldest to newest. Report is the previous category. Update Information is the next category.